Melantrys’ Page » Blog Archive » Whoops, it’s winter! This entry was posted on Sunday, December 4th, 2005 at 11:20 pm	and is filed under weather, photos, ouch.... You can follow any responses to this entry through the RSS 2.0 feed. You can leave a response, or trackback from your own site. Wow! 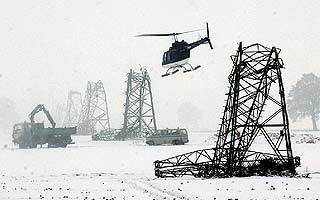 I have never seen so many transmission towers broken like this! I think that your lay person’s insight is actually quite good. These failures were probably caused by what in the U.S. is referred to as an Ice Storm (you described one). Layer upon layer of freezing rain caused ice builds up on a structure or tree branches. The inevitable result is that something will break from the load. Your idea about snow loading is also correct. 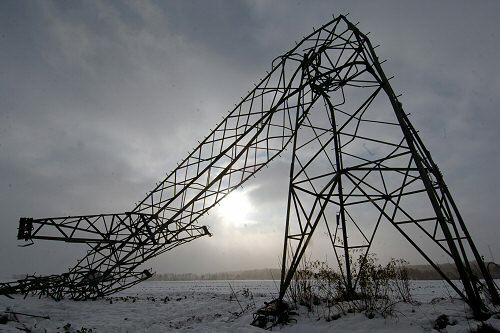 It would be essentially negligible on a transmission tower, as the cross sectional area of the individual members of the structure is quite small. Thus, maybe only an inch of snow could heap up before it began to fall off. I see something very interesting in the first picture. All the towers seem to have bent over in the same direction. I suspect that they were all overloaded by ice and then one of them failed. The connected power lines then pulled over many others like falling dominos. If the towers were 40 to 50 years old and badly rusted, then I am surprised they did not fail years ago! The design of all structures is based on prior records related to load inducing phenomina (wind, snow, earthquate, etc.). The building codes of today are much more strict than they were 50 years ago in the U.S. (I am sure the same is true for Germany). I am speculating here, but there may have been some quick and shoddy construction in Germany not long after the war. But, even if these towers were constructed to meet the building code of the time, the estimation of loads back then was much more of an art than a science. I am sure that the power company is going to do everything that it can to try and prove they should not be held responsible. If they can show that the storm was really unprecidented, then they may get away with just replacing the broken towers. Otherwise, they may have to upgrade their entire distribution network! And then over here they make a lot of fuss about the one village where they were without electricity for two days. It seems tiny in comparison. Yet anything more than 24 hours is pretty much unacceptable in so-called developed western countries like ours. @David: it’s possible that Germany constructed some bad electricity towers, however I would suppose that Germany was still having a lot of the advantages of the former nazi-regime at the time. That means clear, easy to understand and efficient rules, also for construction of things like this. Also I’d daresay that German mechanical engineering and thus also the rules for construction of things like that were superior to those of the US. It could be that a lot of crafstmenship was gone at the time because of the US’ and Soviet-Union’s intellectual theft, but anyway, you get my point already I suppose. It’s just hard to imagine if you understand what I mean, especially with the Marshall aid which could’ve paid for decent metal and all. Hm…. the Marshall aid COULD’VE paid for decent metal and all, but how do we know the money didn’t get diverted by enterprising (Ex?)-Nazis…? Diverted to what? Runned by nazis or not, a strong Germany would be a good thing to any nazi I’d say. yilbaat… hmmm, sounds like bilnaad. was used for the masts, which gets air mixed in during production. That kind of steel doesn’t last 40+ years without becoming brittle. Well, the best laws over here come from dictators really. The first are the general laws ordered by Napoleon. The second is the constitution, ordered by Willem de Derde who was practically a dictator because of the heritage of Napoleon. By using his powers he forced democracy upon the country. It is done very well, but it should be seen as under force. The third are the basics of anti-crime laws, ordered as decretes by the nazi dictators. The laws which came to existence under democracy have all kinds of stupid exceptions to please the Christian morons in the government and if it’s not the Christians then it’s the liberals and otherwise it’s the socialists. Anyway, there’s always stupid exceptions to please some group in the government. And if there got air mixed in during the production then I wonder how they can argue that the masts were good and solid. Melantrys, I am a structural engineer, not a metallurgist, but I do know a bit about steel making. The essentials of the Bessemer process, as far as I know, are still in use today for making steel (however, I don’t know anything about basic Bessemer vs. other types of Bessemer or more advanced methods). The purpose of the introduced air is to oxidize and drive out certain impurities in the molten metal. Also, steel does not become more brittle as time passes. Rather, it is the presence or absense of certain trace elements in the steel that make it brittle or not. For example, I believe that the steel used to build the Titanic had a high sulfer content. This made the steel plates of the ship’s hull more brittle which may have contributed to the sinking of the ship. Another thing to consider is the effect of temperature on steel. When steel is very cold it becomes more brittle. This probably had a hand in the breaking of the towers as well as the sinking of the Titanic. I hope I don’t come off as a “know it all”. Its just that I do have some knowledge that is pertinent to this particular discussion. Frenzie, it doesn’t matter how much snow fell. One meter or ten meters of show wouldn’t have made a difference with respect to the structural integrity of the towers. Snow just doesn’t build up on small exposed structural elements like those used to build this type of tower. Snow is a significant design consideration on large flat or gently sloping roofs. @Frenzie: Diverted into their own pockets I meant. @Sis in general: Hey, I can go home now, I’ve finished work. Already! At 11:03 pm! !